This page contains details of the men listed on the first panel of the 1914-18 Memorial Board at St Mary’s Church Tower, Hornsey. If you are looking for details of other names, you will find Panel 2: Eason to Laidler; Panel 3: Lawen to Shaw; Panel 4: Sherlock to Wright. If you haven’t read it already, you can read the story of how the memorial board panels were rescued from a skip. 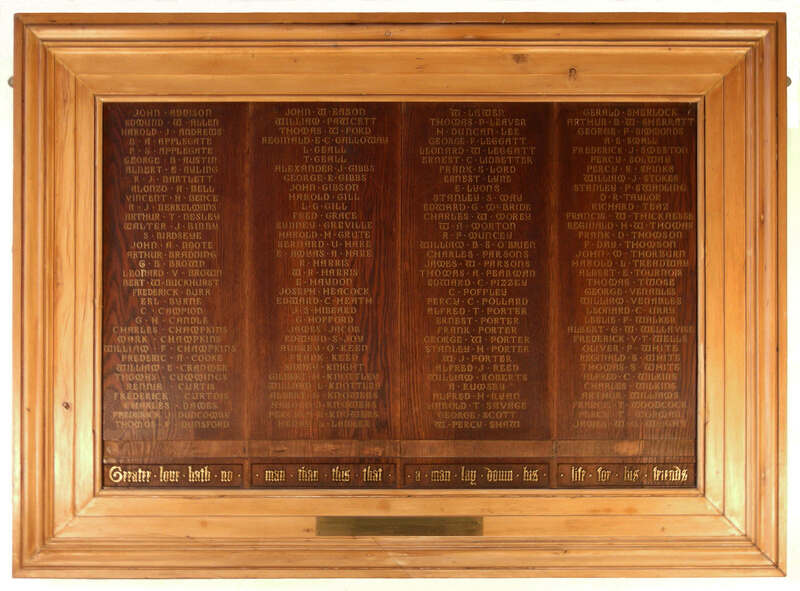 There is also a high resolution image of the memorial board where you can view the original names. The details on this page are taken from the Commonwealth War Graves Commission (CWGC) database. A question mark preceding a name means that we are not absolutely certain this is the correct record. For a small number of men, we have not been able to find any record at all. We plan to gradually add individual memorial pages on this website for the men about whom we can find more information. If you know anything about any of the men, we would love to hear from you. You can either email the archive team, or leave a comment at the bottom of this page. Cemetery/memorial reference: Pier and Face 6 D and 7 D.
Cemetery/memorial reference: X. B. 46. Son of Walter John and Kate Andrews, of 31, Westfield Rd., Hornsey, London. Cemetery/memorial reference: Pier and Face 16 B and 16 C.
Cemetery/memorial reference: M. H. 15. Son of Mr. and Mrs. Austin, of Hornsey; husband of Ada Florence Austin, of 52, Boyton Rd., Hornsey, London. Cemetery/memorial reference: VII. F. 17. Son of George and Sarahfino Bence, of 40, Westfield Rd., Hornsey, London. Cemetery/memorial reference: II. C. 9. Son of Alfred and Louisa Berkelmans; husband of E. A. Berkelmans, of 77, Beechwood Rd., Hornsey, London. Cemetery/memorial reference: XXII. D. 11. Cemetery/memorial reference: Pier and Face 8 C 9 A and 16 A. Son of the late E. J. Birdseye. Son of John Henry and Edith Mary Boote, of 47, Hillfield Avenue, Hornsey, London. Cemetery/memorial reference: IV. A. 5. Brother of Horace Frederick Bradding, of Rathcoole Avenue, Hornsey, London. Cemetery/memorial reference: Pier and Face 9 D.
Son of F. W. and Kate E. Buckhurst, of 5, Campsbourne Rd., High St., Hornsey, Middx. Cemetery/memorial reference: II. D. 11. Son of Mr. and Mrs. Burr, of 15, Pembroke Rd., Hornsey, London. Cemetery/memorial reference: Pier and Face 12 D and 13 B. Son of Harry and Emma Campion, of Nottingham. Cemetery/memorial reference: IV. E. 42. Son of Fredrick Champkins, of Hornsey, London; husband of Grace Usher (formerly Champkins), of 67, Myddelton Rd., High St., Hornsey, London. Son of Frederick Champkins, of 19, St. Joseph’s Rd., High St., Hornsey, London. Cemetery/memorial reference: I. I. 10. Son of Frederick Champkins; husband of May Palmer (formerly Champkins), of Boyton Rd., Hornsey, London. Cemetery/memorial reference: Panel 25 to 27. Son of James Moody Cooke and Frances Edith Cooke, of 19, Palace Parade, Hornsey, London. Enlisted Aug., 1914. Also served at Gibraltar. Read the comment by Noelle Greenaway, Frederic’s great-niece. Son of Mrs. Z. Curtis, of 2, Walther Avenue. Tottenham, London. Cemetery/memorial reference: I. D. 22. Only son of Harry Leonard and Florence Alicia Dames, of 73, Mayfield Rd., Stroud Green, London. Cemetery/memorial reference: Panel 113 to 115. Son of Amy and the late Frederick Duncombe. Native of Hornsey, London. Cemetery/memorial reference: VII. H. 3A. Cemetery/memorial reference: I. C. 13.